This is my go to watch for all occasions and outfits. 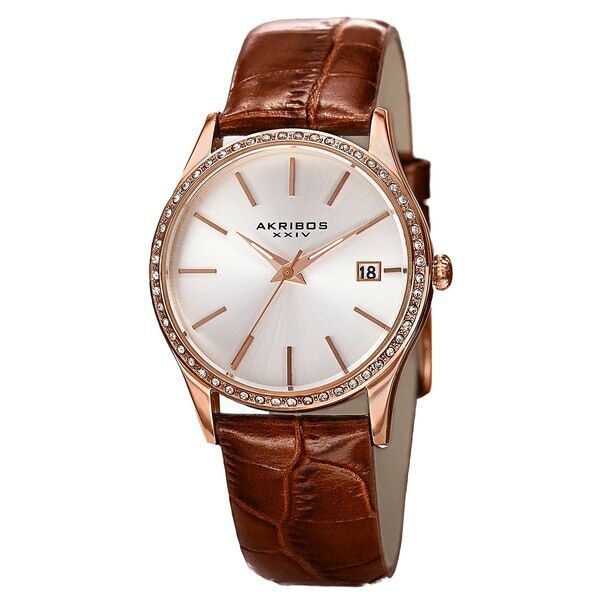 Sharp and chic, this Akribos XXIV women's timepiece conveniently displays the date. It features a square grain alligator embossed genuine leather strap. The step designed bezel filled with genuine Swarovski crystals creates a beautiful dazzling effect. Worked and looked great.why do you require review with 25 words or more? Totally ridiculous. If we see it's great that should be enough for you want to go into more detail than that should be our suggestion and feelings. This is a total waste of time. And overstock.com should put an end to this!!! I don't understand nowhere you others as to why you insist upon a bunch of bull. Will definitely stop using your service if I can't give you a simple star rating and say something nice without having to write paragraphs and go on anon about the product . End of story . Enough !! Like strap and color. price is good also.